Recently we brought home a mother with three little week old triplet babies from the hospital. The mom has a bad infection from a C-section and was very sick and running a fever. We sent her back to the hospital to be admitted with an IV drip but within a few hours she was back at Neema after refusing to stay at the hospital. She had cried when she left and begged us to take care of her babies so it was no big surprise she refused to stay in the hospital. We have a full time nanny helping her around the clock. Her home in Arusha where she is living is not finished, there is no running water or electricity in the house and there was no apparent food nor preparations for the babies. Her husband was with her but said he had to leave town for work in a few days. Since she could barely stand up she could not possibly haul buckets of water to the house while constantly nursing one or more of the babies and still prepare food for herself and her other little 4 year old boy. She is a teacher and is so thankful for our help. Social Welfare evaluated the situation and said the babies would probably not survive if they went home. Fortunately we have two special volunteers here right now, Dr. Jon Walker, an ER doc, with his wife Sarah and their three children from Joshua, Texas and Sharon Bonogosfsky-Parker, a pediatric nurse from Billings, Mt. 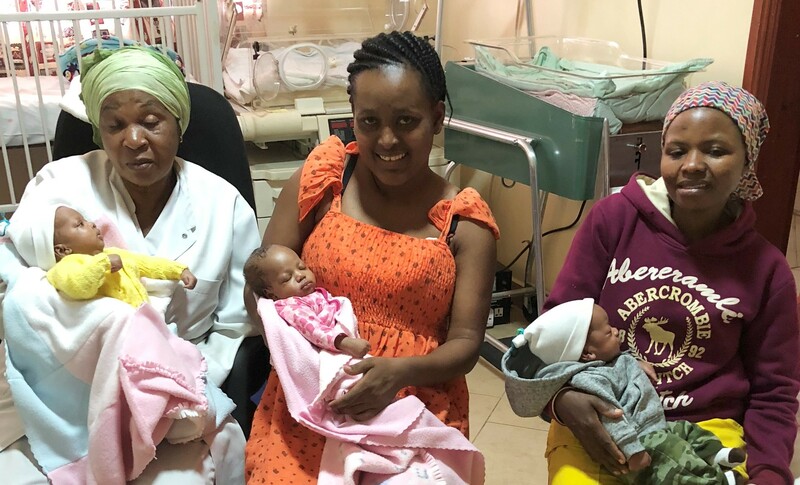 Sharon also teaches moms good breast feeding skills so she has shown the mother how to nurse two babies at a time and also pump for the third baby. Dr. Jon was able to diagnose that the little boy triplet had a broken leg. So back to the hospital for the little guy. Poor babe has a cast on his little finger size leg! They think it most likely happened at the birth. Mom and babies will stay at Neema until they are all well and strong enough to go home. Neema is paying for the around the clock extra nanny and all the medical care for the mother and babies. You can help with those expenses by donating to Neema Village.